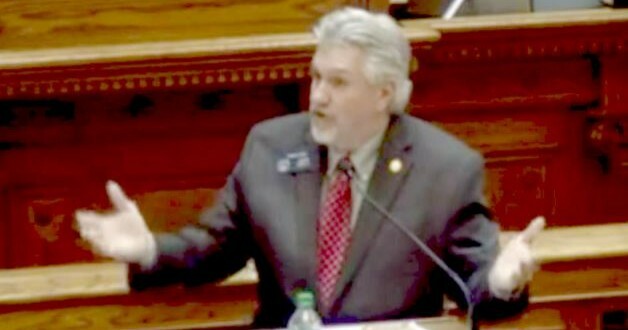 GEORGIA: License To Discriminate Bill Passes State Senate, Sponsor Admits It Protects The KKK [VIDEO] - Joe.My.God. The broad scope of the bill, which combines a House-passed measure with an even broader Senate bill, has alarmed many observers, including state Sen. Emanuel Jones. In a debate over the bill today, Jones asked its sponsor, Sen. Greg Kirk, if the Ku Klux Klan would count as a faith-based organization protected under the law. “I guess they could,” Kirk answered, adding, “I don’t know what would stop them.” When Jones asked Kirk if that seemed like a problem to him, Kirk responded that it did not because the bill “certainly isn’t directed” at the KKK. Kirk then compared the KKK to Beyoncé’s “tribute to the Black Panthers” at the Super Bowl, saying that the Black Panthers would also be protected under the legislation. Lambda Legal condemns the passage of the discriminatory FADA in the Senate today and we urge the House to reject this discriminatory bill. Freedom of religion does not give any of us the right to harm others. There is no pretense but that this bill is directed at and intended to harm LGBT people, but also will apply to non-celibate single people, unmarried couples, as well as interracial and interfaith married couples and their children. We are extremely disappointed that Georgia’s lawmakers have once again targeted LGBT people for discrimination by passing a bill that encourages discrimination and would allow individuals, businesses, government employees and others to claim religious exemptions from laws, regulations, requirements, policies, professional rules of professional responsibilities, ethical standards and more in many areas of life for Georgia’s families, workers and others who will be vulnerable to the whims of anyone claiming a religious justification to discrimination against them. The bill seeks to place personal religious beliefs above all else, even the needs of children, women, domestic violence victims, patients, and more. It’s a toxic recipe for dividing people, creating suffering, increasing disputes, fomenting discord and encouraging discrimination across the state.